Triangle centers on the Euler line, by Clark Kimberling. An interactive applet showing several triangle centers that lies on the Euler line. "Euler Line" by Eric Rowland, the Wolfram Demonstrations Project, 2007. Nine-point conic and Euler line generalization at Dynamic Geometry Sketches Generalizes nine-point circle to a nine-point conic with an associated generalization of the Euler line. 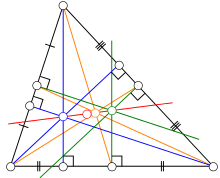 A further Euler line generalization at Dynamic Geometry Sketches Generalizes the Euler line further by disassociating it from the nine-point conic (see above). "Non-Euclidean Triangle Continuum" by Robert A. Russell shows a non-Euclidean Euler line, the Wolfram Demonstrations Project, 2011.